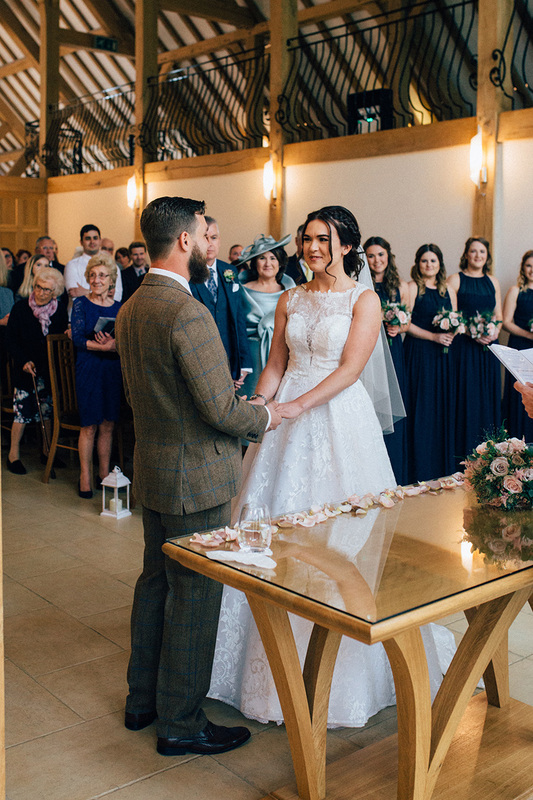 Choosing a Hampshire wedding venue for their dream day, Jade and Ellis’s April celebration at Rivervale Barn was stylish, romantic and filled with beautiful flowers. Setting an April wedding date, Jade and Ellis were on the lookout for a barn wedding venue in Hampshire. Ideally, they wanted to celebrate their entire day in one place – from the ceremony to the evening party. The happy couple chose a modern rustic theme to complement the style of the barn. And, as Ellis is an arborist, they wanted to include elements of wood and trees in their theme. Midnight blue and a dusky pink were the chosen colours and fabulous floral centrepieces with an abundance of foliage adorned the tables along with pretty tea lights. Pink chair ties continued the colour theme. “We wanted to create a relaxed atmosphere so that all our friends and family had a good time,” says Jade. Jade wore a stunning gown from Wed2B. The elegant bride accessorised with diamond earrings, sparkly shoes and a garter made from fabric from her mother’s wedding dress. Ellis hired a tweed suit from Black Tie in Crowthorne. Meanwhile, the five bridesmaids were stunning in long midnight blue dresses while Jade’s flower girl wore a white dress with midnight blue sash. Following their ceremony at Rivervale Barn, the newlyweds and their guests enjoyed Pimms, White Peach Sangria and canapés before moving in to dine. A delicious wedding breakfast started with a smoked bacon Scotch egg with fillet of beef and dauphinoise potatoes for the main course. As day turned to evening, it was time to dance. Berkshire Events took control of the entertainment for the day, from the ceremony music to the evening disco. For their first dance, Jade and Ellis took to the floor to ‘Crazy Little Thing Called Love’ by Queen.